Live your best life in 2019! Join Catapult Seacoast and Bluebird Self Storage for a Vision Board Workshop on Thursday, January 10 from 5:30-7:30pm at Bluebird Self Storage in Greenland. Join us for our annual holiday party on December 12, 2018 from 6-8pm at the Sheraton Portsmouth Harborside Hotel. Enjoy networking opportunities, hearty hors d’oeuvres, a cash bar, and a raffle drawing with several amazing items donated from local businesses. Tickets are available for purchase on eventbrite for $20. You can also purchase tickets at the door for $25/pp. Get wild! 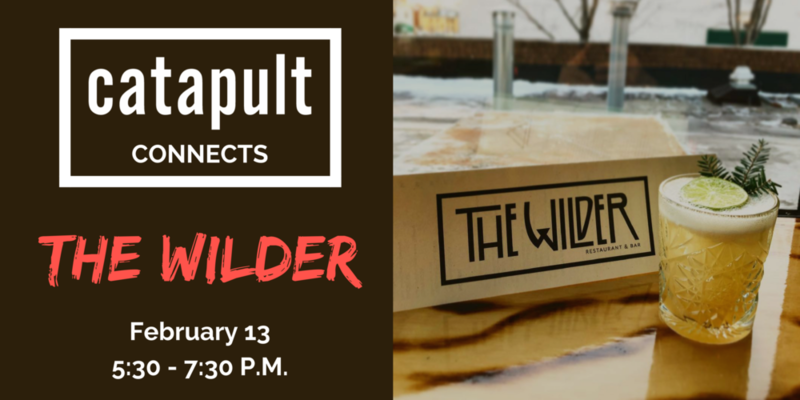 Join us on Tuesday, February 13th from 5:30-7:30 p.m. at The Wilder in downtown Portsmouth for our monthly Catapult Connects networking event! Help us welcome this hot new restaurant and bar to the area. Enjoy a crisp beverage while connecting with other young professionals in the Seacoast area. This is the perfect setting to network with new people and meet up with old friends. This event is free and open to the public (bring a friend!). Please RSVP online. See you there! This event is sponsored by Northeast Credit Union.